Kesar Phirni is a delicious, insanely easy to make festive Indian Rice pudding which can be made with just 4 basic ingredients! Really! The first time I made it, I was surprised at how easily it together! Creamy Indian rice pudding made in less than an hour without any complicated steps. 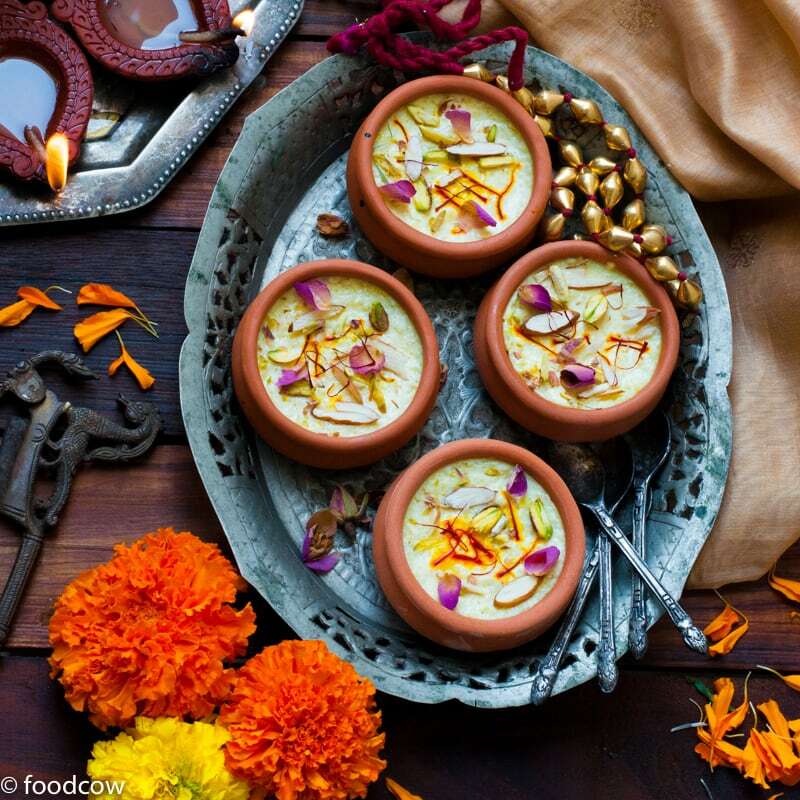 This North Indian dessert is made on almost every special occasions and festivals.It’s is actually a type of Kheer made with Coarsely ground rice and served chilled in earthen pots.Usually it’s decorated with silver or gold filgiri foil sheet also called vark or varak in india along with slivered dry fruits. Kesar phirni is made by boiling ground rice in Saffron flavoured milk.The whole process takes less than an hour to make. Though the cooking process is easy, there is one step which is crucial – reducing the whole milk to a point that it’s almost half it’s starting volume.This step will reduce the water content in the milk and make the pudding extra creamy and thick. Once your phirni is made, it has to be chilled,prefferably in earthenware. By changing the flavours, you can make a lot of different types of phirnis. Some great flavours that I personally love are -Rose Phirni ,Makhana Phirni ,Mango Phirni & Pista Phirni. Phirni can also be made dairy free by using almond milk or any other nut milk instead.If using nut milk, the milk doesn’t need to be reduced.Also, swap out white sugar for jaggery if you are avoiding processed sugar. There are many types of Kheers made in India- with tapioca pearls(sabutdana) , vermicelli ,lotus seeds(makhani) , broken rice and semolina(sooji). Phirni is a type of kheer, made with coarsely ground basmati rice , served chilled in earthen pots. The texture of Phirni is very different from other Kheers – usually it’s thicker and more creamy. Chilling prepared phirni in earthen pots makes the pudding even more delicious, if that was even possible. Once your rice pudding is cooked, it’s poured into an earthen pot and chilled overnight before serving.This does two things – it adds flavour and also makes the phirni thicker as the earthen pots absorbs the water. Kesar Phirni - Festive Saffron Rice Pudding made with whole milk, rice and sugar, served in earthen pots on festivals. Soak the rice in water for 2-4 hours. Take one pinch of Saffron and soak it in 2 tbsp of warm milk. Using a thick bottomed pan or kadai, heat the milk.Add crushed Cardamom pods.Bring to boil and simmer for 15-20 minutes ,while stirring it occasionally. The milk should approximately reduce to half it's volume.Remove the cardamom pods. Add the sugar, soaked kesar and coarsely ground rice to the reduced milk. Give it all a stir.Cover and cook for 10 minutes on low flame.Check the consistency and if the rice is cooked. Cook in open flame (without a lid or cover) to make it thicker. Let it cool slightly.Pour it into earthen pots for added flavour.Cover and chill overnight. Garnish with a few strands of kesar and slivered almonds and pistachios. Other amazing Indian dishes to make during festivals.